The single most important ingredient after you get the talent is internal leadership. It’s not the coaches as much as one single person or people on the team who set higher standards than that team would normally set for itself. This Saturday afternoon, the Collingwood and Richmond Football Clubs will take part in a blockbuster encounter in front of a full house at the MCG. It represents the biggest contest between the traditional rivals since the 1980 Grand Final (which ended in a 81-point victory for the Tigers). However, we have to look back 90 years to find the peak of their rivalry. In a 3-year period between 1927 and 1929, Collingwood and Richmond contested in 3 consecutive Grand Finals – all won by the Magpies. The rivalry reached its crescendo in the 1929 season with the Magpies on a quest to achieve a 3-peat. The Magpies remarkably remained undefeated for the entire 1929 home & away season, winning all 18 of their matches. [The number 18 is certainly the magic number of the week as Richmond is on its own quest to win 18 matches in a row at the MCG]. But in their 1929 Semi-Final clash, the Tigers remarkably defeated the Magpies by 62 points. It was described as “the greatest upset in finals history” . The shock was only temporary however, as two weeks later in the Grand Final the Magpies achieved redemption to win their third successive premiership, defeating the Tigers by 29 points. In all, the Magpies won 4 successive premierships between 1927-1930 and became known as The Machine Team. As the only team to have achieved a 4-peat, the Machine Team has some justification to be considered the Greatest AFL Team of all time. At the helm of the team was the legendary coach Jack McHale, a 7-time premiership coach of Collingwood. Whilst at full forward they had the star player of the competition, Gordon Coventry, who in his time at the club broke all the goal scoring records. He was the first player to kick 100 goals in a single season (achieving the feat 4 times) and won the league goal kicking on 6 occasions. He was also the leading goal kicker at Collingwood for a remarkable 16 consecutive seasons between 1922 and 1937. Without warning or explanation, the Collingwood committee dumped its captain Charlie Tyson on the eve of the 1927 season. The timing of the decision fuelled speculation that the skipper had ‘played dead’ in the 1926 Grand Final. The allegations were never proven, and Tyson would vehemently deny them to his dying day. Syd Coventry was also no slouch on the field, he won the Brownlow Medal in 1927 and was amongst the best on ground in 3 of the 4 Grand Finals he played as skipper (1927-1929) and in the fourth (1930) he was effectively a player-coach as Jock McHale was absent due to illness. However, his sphere of influence on the playing group extended well beyond the football field. With the Machine Team era coinciding with the Great Depression, the Collingwood Football Club cut the player wages midway through the 1928 season. With a player strike appearing unavoidable, it took the intervention and negotiation of Syd Coventry to avoid the player strike (the players agreed to the pay cut) whilst maintaining the spirit of the club on their quest for further premiership glory. The Machine Team only existed because of the presence of Syd Coventry. Sam Walker discusses the concept of a captain being the most important element of a successful sporting team in his excellent and highly recommended book, The Captain Class. In the book, Walker first collates a list of the greatest sporting teams in history; from which based on a set of stringent criteria he narrows the list to the greatest 16 sporting teams of all time. The Machine Team was among them. From a review of the 16 teams, some had a GOAT (Greatest Of All Time) player, some had an enviable depth of talent, some had an abundance of money, some were exceptionally managed, and some possessed a perceived genius coach. However, Walker identified that not one of these variables were consistent among ALL 16 teams. But what Walker did identify, was that the ONE common thread between all 16 teams was the characteristics he saw in the player that led them. The concept of the Captain being the critical element of the freak teams in elite sport is an interesting concept. Considering the more recent history of the AFL, both the Brisbane Lions and Hawthorn have achieved 3-peats. Both teams were laden with talent and had figurehead coaches – Hawthorn with the tactical and motivational genius of Alistair Clarkson, whilst Brisbane the authoritative figure and legend of the game Leigh Matthews. But is it possible that the most important individual in both teams was the captain? Without Michael Voss (Brisbane) and Luke Hodge (Hawthorn), would the 3-peat for either team have been possible? Both were tremendous talents, but they also had a hard edge, leading from the front through physicality when they needed to and not scared of pushing close to the limits of the rules. Unsociable Hawks anyone? To confirm this hypothesis, perhaps we need to look no further than the 2017 Tigers. Dustin Martin had one of the great individual seasons, the mosquito fleet forwards took forward half pressure to a new level and Alex Rance became the ultimate defender and All-Australian Captain. They all played a part in the rise of the Tigers, as did the MCG effect, the well-publicised team bonding sessions and a re-invigorated Damien Hardwick and support coaching staff. But potentially the most important transformation of all was the change in mind-set of the Captain – Trent Cotchin. Cotchin laughs, and they all do, too. There was certainly a change in attitude by Cotchin on the field in 2017. His attack at the football was far beyond anything we had previously seen at anytime during his career, and he wasn’t afraid to push his aggression to the limits (think of the bump on Dylan Shiel in the preliminary final). 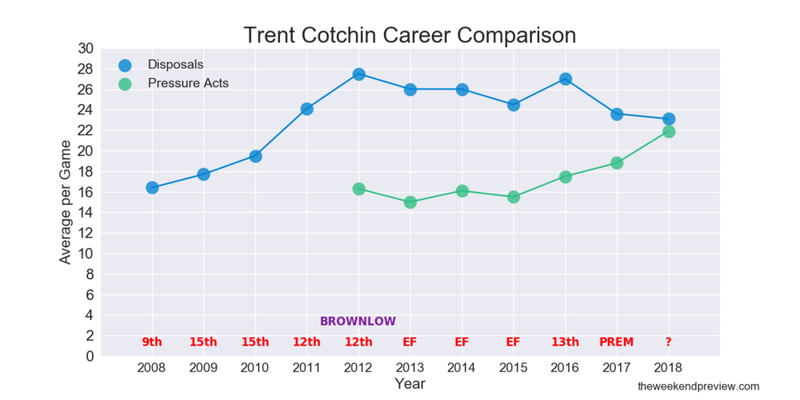 As presented in Figure-2, this team first mindset indeed did result in a drop in possession count for Cotchin in 2017, a trend that has continued into 2018. However, this drop in possessions has coincided with a surge in Cotchin’s pressure acts per game, symbolic of his new approach to football. Led by Cotchin, Richmond appears to have gone to an even higher level in 2018. A Top-2 finish appears a certainty, which would mean the Tigers may not need to leave their beloved MCG at all during the finals series on their way to another premiership. However, just as the Tigers provided a speed hump to the Magpies unbeaten run in 1929, the Magpies have the form and class to cause an upset this weekend and halt the Tigers record run of 17 consecutive wins at the MCG. Collingwood captain Scott Pendlebury himself has shown a selfless attitude towards his football in 2018. Pendlebury remains one of their best midfielders, yet he has been more than willing to play a negating role on the opposition gun midfielder when the need requires. However, for this week at least, the absence of key players, most notably Jordan de Goey and Adam Treloar, makes the challenge of toppling the Tigers that little bit harder. A competitive game it may be, the Tigers still have the edge. Walker, S. (2017).“The Captain Class: The Hidden Force that Creates the World’s Greatest Teams”. Penguin Random House UK, London. Mike Krzyzewski of Duke University has won more games than any basketball coach in the history of the NCAA’s Division I.
 Roberts, M. & McFarlane, G. (2004).“The Official Collingwood Illustrated Encyclopedia”. Geoff Slattery Publishing Pty Ltd, Melbourne, Victoria. Marshall, K. (2017).“Yellow & Black: A Season with Richmond”. The Slattery Media Group, Melbourne.